The biggest congestion charge scheme ever to be undertaken by a capital city has got off to a relatively trouble-free start in London. Motorists travelling into central London on Monday morning faced a £5 daily charge for the first time. The scheme designed to alleviate traffic gridlock in London is being watched closely by cities across the UK. As the first rush-hour of the scheme ended, there was little sign of the feared traffic chaos or major public transport problems. This was partly due to lighter traffic during the half-term school holidays. Opponents of the scheme, including Conservative leader Iain Duncan Smith, have taken part in protests across the capital. Up to 30,000 drivers were expected to leave their cars at home. London Mayor Ken Livingstone had anticipated a "bloody day" as commuters came to terms with the scheme. 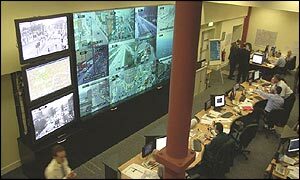 Speaking from the traffic control centre, he said: "I'm just waiting for something to go wrong." Motorists failing to pay the £5 daily charge - payable 0700-1830 GMT weekdays - risk being caught on camera and fined £80. Officials from 30 other British cities, including Edinburgh, Cardiff, Belfast and Bristol are also considering introducing congestion charges if the scheme is successful. By Monday afternoon 57,000 people had paid the charge. The first fines for non-payment will not be sent out until Tuesday. Mr Livingstone said it would be Easter before it was known if the charge was succeeding in reducing traffic and raising money to re-invest in transport. But he said: "If there is a collapse at the call centre or if there is gridlock then clearly the system will have failed." However there were no reported delays on the Transport for London congestion payment phone line. Bob Kiley, London's transport commissioner, told BBC News it was "inconceivable" that there would not be problems but he did not anticipate these would be too difficult to solve. London Underground said it had noticed "no significant difference" in passenger numbers during the rush hour. But opponents of the scheme have launched a legal challenge calling on the courts to order a review by the mayor of the charge for lower paid workers. Solicitor Steven Alexander said people who worked on the markets travelled into work in the early hours and drove home against the traffic. "These people should be taken out of the scheme altogether. Frankly it is unfair." At Smithfield meat market, Mr Duncan Smith met traders before around 200 workers marched to City Hall. Mr Duncan Smith said: "It's a nonsense that they are doing this. It is hitting the wrong people." Market chairman Greg Lawrence said: "Make no mistake - the next march will be 20 times the size of today's and the following march will be 20 times bigger than that". This is an excellent idea. Stop being selfish or pay the price! "So far London hasn't ground to chaotic gridlock"
"This is very different to a poll tax"
"If this all goes badly wrong, there is noboby else to blame"